Happy Canadian Pot Legalization Day! A strong believer that "no news is new news", I wondered if there were any comparisons to a century ago when the prohibition on alcohol ended. My intention was to write a very detailed post about the fears before legalization and the outcomes afterwards, but I simply did not have the time to dig into it as deeply as I wanted to. Here are some of the things I discovered while dipping my toe into the debate from 1923 that was eerily similar to that of 2018. 1. Prohibition was voted out in a 1921 province-wide referendum. Looking at its options, the provincial government decided that there was no use putting a new Temperance law in place and fighting the public about it. 2. Provinces such as B.C. 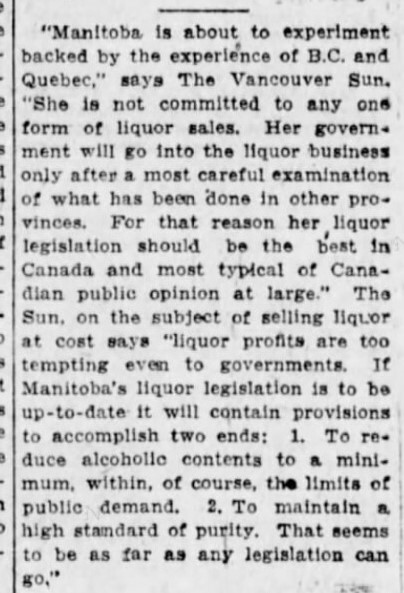 and Quebec had already gone down the provincial liquor commission route which gave the Manitoba government other jurisdictions to study and learn from. 3. There was lots of profit and tax dollars to be had if illegal producers and distributors were squeezed out. Political debate and letters to the editor brought up scenarios of increased crime from drunkenness, people who used liquor "purely for medicinal purposes" through a prescription from their doctor falling through the cracks, and high government markups not actually curbing the black market. One thing that is different between the two debates is the strong moral leanings against legalization by the Temperance movement and religious organizations which are a shadow of their former selves in today's society. 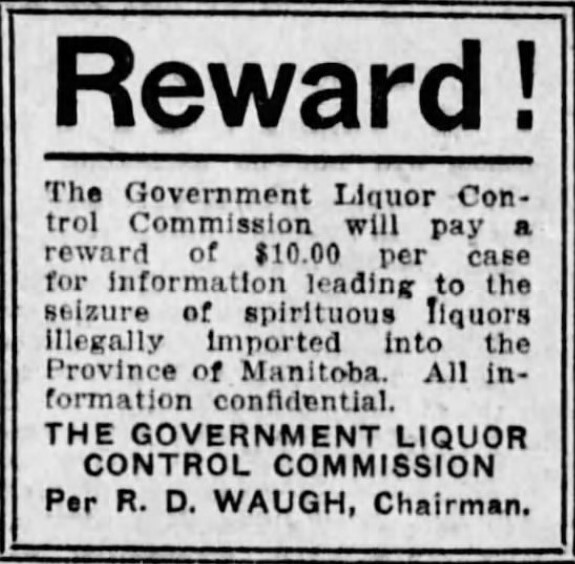 The roll out of legalized liquor sales was slow under head liquor commissioner R. D Waugh. The lawyer and former mayor of Winnipeg was a well-respected citizen. Even former political foes thought he was a good choice for the job which required creating a vast web of regulations and careful attention to detail. The first month of sales by the Manitoba Liquor Control Commission, MLCC, both through retail outlets in Winnipeg, Brandon and Portage, and to the many thousands of permit holders across the province, such as bars, was impressive. By 1926, the MLLC's gross profit was about $1.1 million for the year and by 1930 had reached $2 million. Profits took a hit during the Depression and were back down to about $1 million per year by 1935. As for curbing the black market, its hard to say how that went as there were obviously no figures for how much alcohol was being produced before legal sales began. There certainly were still arrests and prosecutions though there did not seem to be a spike. 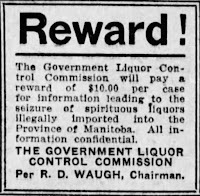 The MLCC helped its cause by working with Ottawa to strengthen border controls on liquor coming in from the U.S. and even offering a reward in the mid-1920s for tips about illegal importers. The Temperance movement predicted a huge increase in cases of public drunkenness and maintained publicly that is what happened after legalization. The numbers don't appear to support their claim. Interestingly, the number of doctor's prescriptions for alcohol for medicinal purposes dropped by half as soon as liquor stores opened. 1. Society didn't grind to a halt. 2. The myriad of laws and regulations put in place didn't cover every conceivable circumstance and, nearly a century later, liquor laws are still being retooled to keep up with the times. So it took only two years from the time of the referendum till the first legal liquor outlet opening. While Canada never had a specific referendum on legalization of cannabis, from the date the Trudeau Liberals were elected until October 17th seems longer, almost three years. Were women voting at the time of the referendum? The province was likely able to shorten the time it took to start selling alcohol because a couple of provinces had already started doing it and we borrowed heavily from both of their systems. Also, being a province, it didn't have to worry about a bunch of jurisdictions under them squabbling or complaining and causing delays - cities are provincially created entities so they can impose what they like. Yes, women should have been able to vote in that election and referendum. The rules changed in 1916 to allow certain women (of legal age and of British stock) to vote. In fact, some of the big leaders in the Temperance movement were women.